Unique wedding favors with one ivory and one gold tulle, tied with ivory satin ribbon. In Greece wedding favors made with tulles, it's a classic idea which is always in fashion. They are available in many colors and contain tulle with 7 sugar coated almonds of the company Chatzigiannakis. 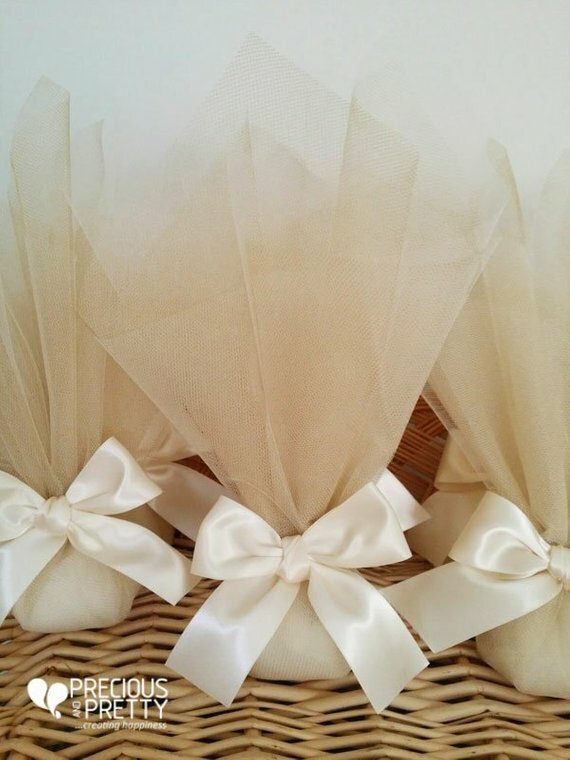 https://www.preciousandpretty.com/2018/12/unique-wedding-favors-with-ivory-and-gold-tulles-g32.html Greek Wedding Favors|Orthodox Crowns|Stefana|Baptism Invitations Unique wedding favors with ivory and gold tulles G32 Unique wedding favors with gold and ivory tulles made in Greece Product #: Greek Wedding Favors|Orthodox Crowns|Stefana|Baptism Invitations_6505027951494551997 5 stars out of 5 reviews.